In A Vase On Monday ~ "It's A New Day"
~ lyrics from the fabulous song 'Feeling Good' by Nina Simone. In this case the new dawn is supposedly dahlia 'American Dawn' which is a new to me dahlia this year. I say supposedly because I'm not convinced that it is the same dahlia that features when I search for images of dahlia 'American Dawn' on the web. It caused me some concern as soon as I saw the first flower appear which was entirely different in colour and patterning to what I had been expecting. I was a yucky orange and yellow combo but then flowers that followed were so very different. Whatever it's identity it has been a most welcome addition. I am though tempted to order 'American Dawn' from a different source in the future so that a comparison can be made next summer. I was ahead of the game and the rain mentioned by our hostess Cathy over at 'Rambling In The Garden', as I had noted Sunday's forecast and in fact picked my blooms late on Saturday afternoon. It had rained for a good part of the morning but the sun made an appearance later so the flowers had dried out by the time I picked them. Yesterday was decidedly wet and chilly here for most of the day but on the plus side the reservoirs may be filling up again. The vase accommodating the dahlias is an old stoneware jug which I think was bought in a local charity shop many moons ago. My prop this week is a recent purchase in the shape of a 'Fitbit' which is currently on my wrist. This hot summer made me come to the decision that I must make a serious effort to lose weight as I felt so uncomfortable and lacking in energy. One or two readers who have met me in the flesh are aware that I am lady of ample proportions and sadly have been for most of my adult life. After some gentle encouragement from one of my nieces and a lunch time chat with a trio of lovely nurses at the Southport Flower Show I have bought a basic Fitbit. Nothing too fancy but it set to record a daily target of 10,000 steps which I've managed to achieve every day so far for the last week. It certainly has kept me on my toes and I apologise for not commenting on all the blog posts that I have read due to less sitting down time :) I know that I must also revise my diet but this is is a first step I hope to a healthier life. 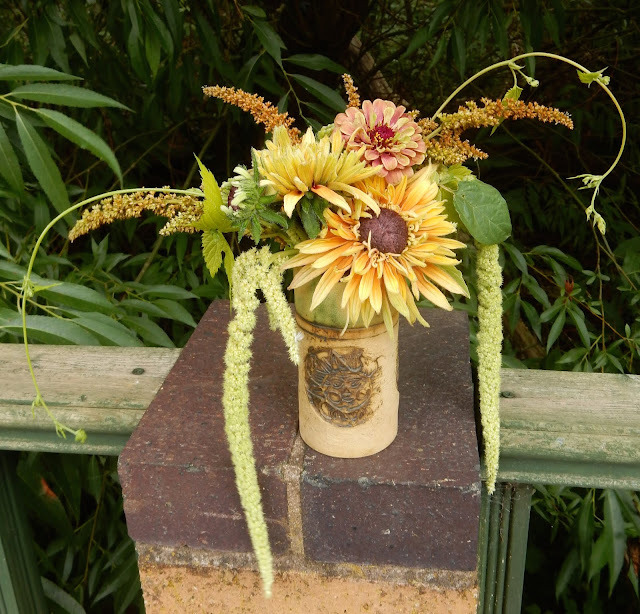 Thanks as always to our inspirational and gracious hostess Cathy over at 'Rambling In The Garden' for the motivation to put together a vase most Mondays. I wonder how many steps that process could involve. The vase is now sitting on the kitchen windowsill, where the flowers have lost their different shades in the reduced light and appear a most pleasing gentle dusky pink to the eye. P. S. - Thanks to Cathy's comment I now know that my dahlia isn't 'American Dawn' but 'Jowey Winnie'. Although the colours seemed to match I couldn't reconcile the shape of my dahlia with images of 'American Dawn'. I put it down to my labelling going astray somewhere along the line as I had also planted what I thought was 'Jowey Winnie,' for her to be all foliage only or so I thought. Is it my imagination or does today's vase have a decided hint of autumn about it? The fact that the skies were rather dull when I took the photo didn't help matters much. The cooler but much kinder weather has continued and looks as if it will be about this week too. I'm feeling much more energetic and have a long list of both indoor and outdoor jobs to tackle so time for list making methinks. More of the rudbeckia 'Sahara' mix that I grew from seed earlier this year. The bud that was tantalisingly teasing me last week has now opened and I think that it might be the promised merlot shade. The flowers so far have all been double with the exception of one plant that has single flowers. It's in the vase but is hiding at the back along with a deep dark red dahlia bud. As I wrote last week I think that I sowed the rudbeckia in February but I've still not found the label. I am coming to the conclusion that perhaps I've stuck it in the ground at the allotment so will check in due course. Another zinnia from a Sarah Raven 'Pale Zinnia Mix'. At the risk of repeating myself I'm delighted with these. Some snipings from one of the elderflowers that are dotted about the garden. These were all inherited but are most welcome both for their frothy white flowers in spring and for the berries at this time of year. As you can see the berries are already on the turn. The berries are a perfect delicacy for birds especially wood pigeons who seem to have the most healthy of appetites. They are not likely to last long but hopefully will divert any passing birds from the crabapples for now. Our lovely hostess Cathy over at 'Rambling In The Garden' is celebrating Monday with some fabulous glowing dahlias. Do visit her if you haven't already. I wonder what else is filling vases big and small this week. I'll have fun finding out later but for now list making calls. Lower temperatures, leaden grey skies and some rain have been huge make me smile factors over the last few days. Hopefully the weather will continue in the same vein a while longer although today's vase is still very much on the sunny side. A couple of swirls of humulus lupus aureus or to give it its common name golden hop. This grows over an arch and is one of the banes of himself's life as he has to pass underneath it with the lawnmower. If you've not come close up and personal with this climber before the texture of the leaves is like velcro! The hop has taken off this year and has sprawled higgledy piggledey in all directions lapping up the sunshine. In fact it has now formed an impenetrable thicket so another route to the what passes as a lawn has had to be found. I think that this is its glory year and whilst other plants have been stuttering and gasping its has loved the long hot summer. Some spikes of amaranthus cruentus 'Hot Biscuits'. I included this in a vase last month. I like the colour but am not so struck by the fairly upright tassels so it will not feature on the repeat seed order. On that order though will be zinnia 'Queen Red Lime' which I have been so pleased with this year. Whether my success is down to this particular warm summer remains to be seem but it's a will sow again without any hesitation. Amaranthus caudatus 'Viridis' with those caterpillar like furry green tassels is also on the list doing well in cooler summers too. I think that I sowed the seed in March but can't be sure. Next year I think that I might try direct sowing in May. The foliage is rather nondescript and tends to be nibbled but oh those tassels more than make up for it! Finally and new to me is rudbeckia hirta 'Sahara' which I grew from seed. I think that these were sown at the back end of February in a heated propagator but must find the label from the seed tray to be check. It is described as having "mostly double, velvety flowers is a blend of dusty rose, milk chocolate, copper, pale lemon and rich merlot". I have planted too few of these - only six so will not have the pleasure of the full colour range. So far I have a predominance of the above golden colour which morphs into a pinky shade with age. I'm still waiting with bated breath for one plant to open, the buds of which look as if they could be the "rich merlot" shade. The plants may overwinter but there is no guarantee. This is already near the top of my new seed list with a note to plant them in quantity! Thanks as always to our lovely hostess Cathy who resides over at 'Rambling In The Garden' and who is sharing a veritable explosion of colour in her vase this week. I'm off now into the greenhouse to see if I can find that missing label. Enjoy your Monday whatever you are up to!